The federal tipped minimum wage is $2.13. The service industry is one of the fastest growing job markets in the U.S., made up of a majority women workers. 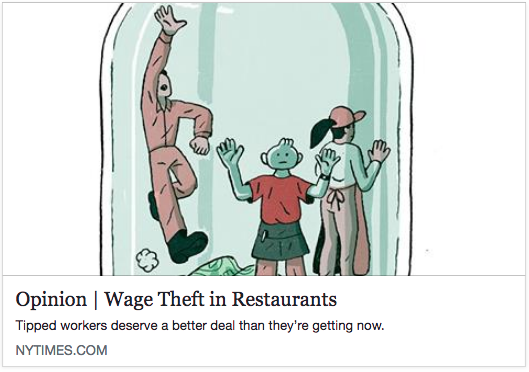 In light of the growing #metoo movement, many restaurant workers are organizing and standing up to call attention to rampant sexual harassment and wage theft. The National Restaurant Association, no friend of workers, is a big business lobby that fights to roll back minimum wage victories won through the struggles and movements of working people in states and cities like Minneapolis, Seattle, California, and even republican controlled South Dakota. In Minneapolis, workers won a $15 minimum wage with Trump in office, and while the political establishment in City Hall first called $15 illegal, then impossible — but through building in communities, workplaces, on high school and college campuses, we won. With the Trump administration attacking workers rights and rolling back department of labor protections, it’s more urgent than ever to fight back, to defend what workers movements have won in the past, and demand #15forAll workers. 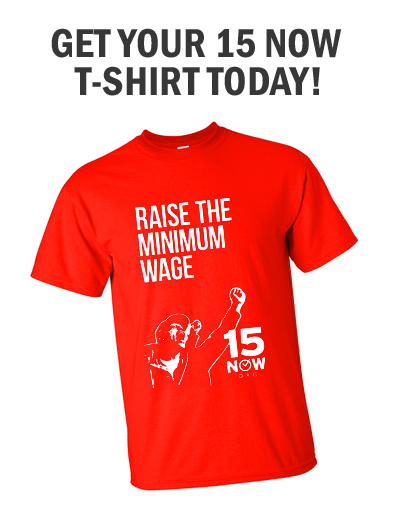 Momentum behind the campaign to bring a $15 minimum wage to voters in Minneapolis is picking up! In the first week of signature collection to get $15 on the ballot, 15 Now and other supporting organizations engaged over 100 volunteers who gathered over 4,000 signatures. 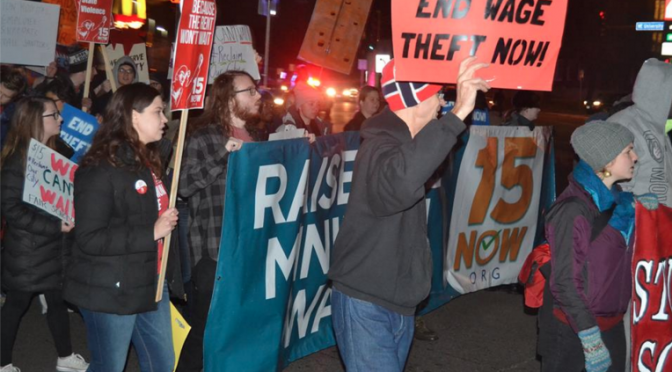 The speed and success in its first week of petition gathering and fundraising, combined with victories for $15 across the country, shows Minneapolis is ready for $15/hour. Support for $15 has been growing for months. On Super Tuesday, 15 Now volunteers passed resolutions in every Minneapolis ward supporting the $15 ballot initiative, and in 100 precincts across the Twin Cities. Sanders decisively won at the Minneapolis caucuses, by 65% or more in some precincts, calling for a $15 minimum wage. Workers have gone on strike numerous times demanding $15/hour, alongside a package of workers’ rights reforms. A poll released last fall conducted by the Feldman Group showed 82% of likely Minneapolis voters supported $15/hour phased in over time. The charter amendment proposes big business raise wages to $15 over 3.75 years, with an extended phase-up over 5.75 years to $15 for small-medium sized businesses. The first step for all workers (to $10/hour) would start on August 1, 2017. A growing list of community organizations and unions are backing this proposal as the correct initiative for Minneapolis. “Mayor Hodges and City Council have had two years to address Minneapolis’ worst in the nation racial and economic inequalities. We need to take our own initiative to get fair wages for local workers,” said Nekima Levy-Pounds, the President of the Minneapolis NAACP. “CEO salaries are at an all-time high while wages for working people have stagnated. All workers need at least $15. No workers, whether they live in Minneapolis or Seattle, can put off paying the rent or putting food on the table. We don’t want to give big business any space to say it can’t be done in Minneapolis,” said Kip Hedges, 15 Now. Thousands of workers across the country took action to demand a $15 minimum wage and other workers’ rights issues, for fair schedules, union rights and paid sick time. In many cities, workers squarely addressed the political inaction of elected officials. Hundreds flooded into city hall or rallied in front of government buildings, to demand that local and state governments, who’ve been under enormous pressure from these rolling and escalating demonstrations and strikes, take urgent action on $15. Today in Philly dozens of fast food workers walked off the job at 6am. 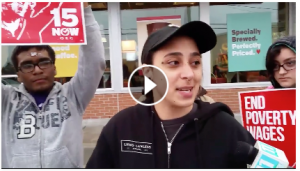 After a 6am strike line at a North Philly McDonalds, workers staged actions at fast food restaurants across Philadelphia. At noon, fast food workers joined janitors organizing with the Service Employees International Union (SEIU) to march on Comcast to demand $15 and a union for all Comcast workers. They attempted to enter the Comcast tower but were denied entrance by police. The main action was a large march from City Hall to a McDonalds in Rittenhouse Square. About 400 people, including progressive City Coucilwoman-elect Helen Gym and State Senator Daylin Leach, who had introduced a statewide $15 minimum wage bill, were joined by teachers union and service worker union leaders. We took over the open-air center of City Hall and marched down Broad street. The march was high energy. 15 Now member and Temple student Zoe Buckwalter closed the rally with a call on Philadelphia’s incumbent Mayor and City Council to take immediate action as soon as they take office to introduce binding $15 minimum wage legislation January 2016 and talked about the ongoing campaign at Temple to win $15 for security officer, cafeteria workers, and student workers. A few weeks after two county legislatures, the Essex and Hudson Boards of Chosen Freeholders, passed a resolution calling on the New Jersey State Legislature to raise the minimum wage to $15/hour, the momentum to fight for $15 was strong in Jersey City. Despite the rain, dozens of workers and students gathered at Jersey City’s City Hall for a rally. Later, Jersey City’s City Council voted to support a statewide $15/hr minimum wage and Mayor Steve Fulop came out in support of the measure. Local organizing and the national #Fightfor15 movement has seriously shifted the conversation about poverty and inequality in New Jersey. In Portland, OR hundreds of people marched and rallied for $15 and a union as part of the national day of action. The rally highlighted local janitors and homecare workers, who raised their voices to demand a $15 wage. There are about 9,000 janitors and homecare workers in the Portland area who still don’t make $15. They are being supported by the Portland Area Campaign for $15, a coalition made up of Portland Jobs of labor and community groups, including 15 Now PDX, that is working to raise wages to $15 for 30,000 Portland area workers by 2017 through contract negotiations, voluntary commitments, and new organizing campaigns. At today’s Dia de Los Meurtos themed rally, workers and allies marched around the Pittock Building chanting to draw down good jobs with living wages. Earlier this year the Pittock Building began hiring out it’s janitorial services to a low-wage, non-union contractor. The building has been the site for other $15 and union protests over the past year. At 4:00 pm on Tuesday, November 10th, the Eau Claire Area School District’s Hourly Compensation Committee met at the school board office. The school district’s recently completed compensation study showed that many workers are underpaid, well under $15 an hour, though the administration has decided to withhold the annual inflationary wage adjustment of 1.67% to it’s lowest paid workers. Members of 15 Now Northwest Wisconsin attended this meeting to demand that the ECASD administration grant this inflationary wage adjustment to all workers making less than $15 an hour.